St. Petersburg Russia is a very attractive city much due to its rivers and canals, embankments and bridges. Our city stands on 42 islands and the number of the bridges is up to 400. In this article we will talk about the bridges you should definitely see on your City Tour St. Petersburg. The Palace Bridge is the main one in St. Petersburg. It was named after the Winter Palace located nearby and was erected approximately one century ago at the time of the last owner of the Winter Palace Nicholas II. Its construction and decoration were interrupted by the WWI. Nowadays on its rails you can see Soviet symbolism which appeared in 1939. It is one of 13 active draw bridges in St. Petersburg – they all span over the Neva River. Every night many gather to see the opening of the bridges and stay up from 1 a.m. to 3 or 4 a.m. in the morning. They enjoy the period of the White Nights in St. Petersburg (from May to August), though the bridges are opened a longer period: from April or May till October only. Why? The rivers freeze the rest half of the year and navigation stops. The Draw Palace Bridge is considered to be one of the symbols of St. Petersburg. The Annunciation Bridge is the first permanent draw bridge to appear over the Neva River. It dates back to the middle of the 19th century and has changed names several times: Annunciation since 1850 (in honour of a nearby church knocked down by the Soviets in the 20th c.), Nicholaevsky since 1855 (after the death of the Emperor Nicholas I who commissioned it), Lieutenant Schmidt since 1918 (the revolutionist who started uprising on the Ship Ochakov in 1905). Several years ago, after the reconstruction, which made it 37 meters wider, it was renamed back into Annunciation. The rail of this bridge was considered to be one of the best examples of cast-iron works of the time. The Trinity Draw Bridge was created for the bicentenary of St. Petersburg to the design of the French company Batinol (fr. Spie Batignolles) at the same time as the Bridge of Alexander III in Paris. Both bridges’ creation was a symbol of a new military coalition between Russia and France. On a small airplane under the Trinity (Soviet name - Kirov) Bridge there flew a famous pilot of the USSR Chkalov, known to conduct the first nonstop flight from Moscow via the North Pole to Vancouver in 1937. He didn’t get into a big trouble for flying under the Bridge in Saint-Petersburg as he was a close friend of the son of Stalin. The risky flight was repeated by another man while filming a biographical documentary about Chkalov in 1940. During your city tour St. Petersburg you will see how close the bridge is to the Neva: it's hard to imagine even a small airplane flying under it! Peter the Great himself could not witness these bridges mentioned above: during his time people were using pontoon or navigable bridges, or were just walking on the thickness of ice in winter in order to cross the Neva. The Hermitage Bridge derives its roots to Peter’s time: at first it was a draw wooden bridge over the shortest canal of St. Petersburg – the Winter Canal. Under the Empress Catherine the Great it became the first stone bridge of our city. Nowadays there are three bridges hanging over the Winter Canal: The First and The Second Winter Bridges and the most famous one – the Hermitage Bridge. It has an unforgettable view with an arch above it repeating its shape: definitely our small corner of Venice. Those who love music by Pyotr Tchaikovsky can surprisingly discover a nickname of the Hermitage Bridge: Lisa’s Bridge. According to the plot in Queen of Spades opera young Lisa threw herself in water from this very bridge. In the original story written by Alexander Pushkin there is a far better end. Anichkov Bridge used to be the main gateway to St. Petersburg of Peter the Great, because the border of the city ran along the Fontanka River. It bears the name of the engineer and lieutenant colonel Anichkov. Following the order of Tsar Peter, he created a wooden bridge which was later in the 18th century reconstructed in stone. In the 19th century architect Brulov created a cast iron rail with mermaids and seahorses. The Fame of the bridge was nevertheless brought by the horse statues designed by Klodt. They have a special story. At first they were supposed to adorn the embankment at the Academy of Fine Arts, but the two Egyptian Sphynxes took their place. So the two different statues showing a young man with a horse were moved to the Anichkov Bridge. On the opposite side there were standing models, made of plaster of paris and painted under bronze to wait for the real ones to be produced. The fate changed the plan: the Emperor Nicholas I presented the first two horse statues to the Prussian King Frederick William IV and they found themselves in Berlin. While the other newly produced pair of statues was sent to the King of Sicily and put in Napoli. Then the copies of the celebrated statues appeared in the environs of St. Petersburg – in Peterhof and Strelna and even near Moscow. Klodt decided not to repeat himself and created a new composition, which adorns the Anichkov Bridge since that time: four stages of a man taming a horse – each statue is unique. The groups of horse–tamers are the WWII Blocade survivors: the statues were buried in the neighborhood – nowadays “Recreation”Garden. Bank Bridge is one of the most beautiful in St. Petersburg to explore on a city tour St. Petersburg. This bridge spans over picturesque Griboedov Сanal and is adorned with the figures of four golden-winged Griffons. These mythological creatures are known to guard treasures and it is no mere chance they were put on this spot: once in the 19th century there was a bank there which gave its name to the bridge. Nowadays St. Petersburg State University of Economics and Finance uses this building. This bridge is lucky to be among three pedestrian hanging bridges to survive in our city. It was the very first bridge in St. Petersburg with a chain and one span. 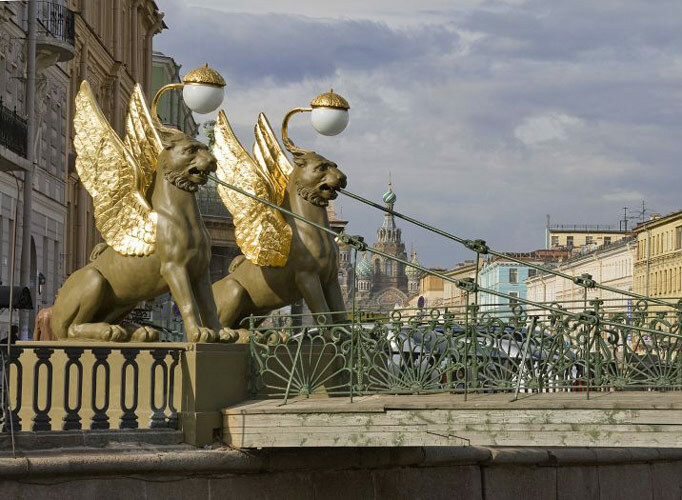 The Lions’ Bridge is one of the most attractive sights in St. Petersburg. It was created by the same team of talented engineers who designed the Bank’s Bridge. The author of the statues of both bridges was master Sokolov. The chains which support the pedestrian Lion’s Bridge are hidden inside the metal tubes filled with wax to prevent from rust. Cast-iron lions were painted in imitation of marble. A small replica of this bridge was done in 1838 for the Tiergarten Park in Germany. These are just a few bridges to explore – there are more waiting for you! We hope you learnt something new and you will definitely join City tour St. Petersburg of Kremlin Tour Company! Welcome on a fascinating journey to St. Petersburg, Russia!